We were at the Green Scythe Fair on Sunday 9th June 2013! We had plenty of visitors who were really interested to talk to us about thatching materials. 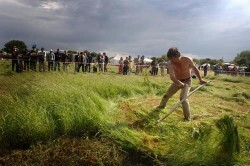 The Green Scythe Fair is a magical one day environmental fair in a beautiful setting on the Somerset Levels run entirely on wind, sun and muscle power. Excellent live music, over 70 stalls displaying traditional skills, crafts and produce, lively environmental debates, delicious organic local food, and a variety of the best ales and ciders. Plus an enlarged kids’ area with activities throughout the day. The Green Scythe Fair includes the celebrated West Country Scythe Championships, known far and wide for the stupendous and often hilarious feats of haymaking by international scythesmen and women, who mow a swathe through the summer festival scene making it probably the most authentic, and enjoyable, country fair in all England! This entry was posted in Activities, News. Bookmark the permalink. CoTTG is nationwide network of thatchers and conservation professionals who believe in the importance of conserving historic thatch and in supporting traditional thatching techniques and materials.